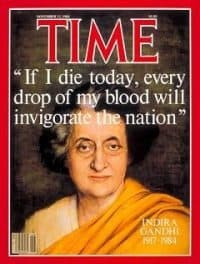 Indira Gandhi was one of the most powerful women of the 20th Century, whose initial rise to power in 1966 was supported by those who labored under the mistaken belief that she would be a timid leader who could be easily manipulated. Quite the contrary, her tenure was marked by ruthless politics and the centralization of government power. During her time as Prime Minister, militant members of the Sikh population, led by the extremist Jarnail Singh Bhindranwale, began pushing for special status for their majority Sikh region of Punjab. The situation became volatile and many were killed in incidents across the Punjab region. As a result, in June 1984 Gandhi ordered Operation Blue Star to flush out the Sikh militants and remove Bhindranwale. The army stormed the holy Sikh temple complex, Harmandir Sahib, also known as the Golden Temple, in Punjab where he was taking refuge. In the following days, nearly 500 were killed by the Indian army, including Bhindranwale; the army suffered over 300 casualties. 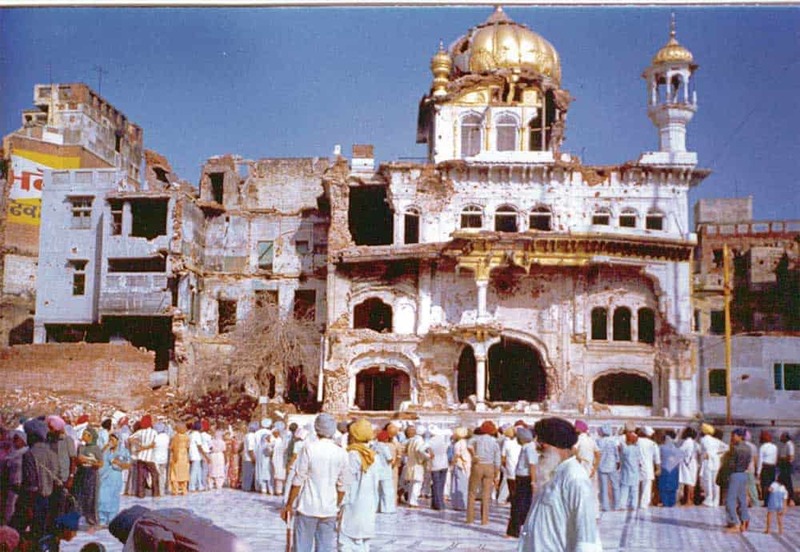 The assault also caused widespread damage to the temple’s structures, which further angered the Sikh populace. Calls for revenge became widespread. Just a few months later, on October 31, 1984, Gandhi was assassinated by her own Sikh bodyguards, sustaining over 30 gunshot wounds. Gandhi’s death was met with outrage, particularly by members of her Congress party and many Hindus. In the following days, almost 3,000 Sikhs were murdered across India, including 2,100 in Delhi alone at the order of certain central government officials and the Delhi police. 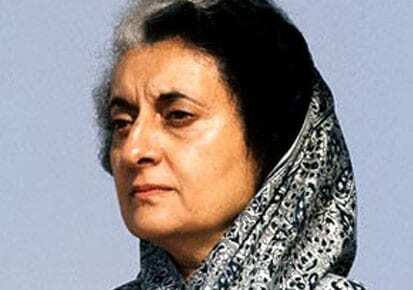 Sadly, Indira’s son Rajiv, who took over as Prime Minister, would himself be assassinated by Tamil terrorists in 1991. Ernestine Heck was a Political Officer in New Delhi, India from 1983-1986, during the height of tensions between the Sikhs and the Indian government. She was interviewed by Charles Stuart Kennedy in December 1997. Robert Goldberg was a Consular Officer and the Ambassador’s Staff Assistant in New Delhi from 1983-1985. He was interviewed in September 2011. Read other Moments on India. HECK: I was head of the Internal Political section, general political reporting section of the Political section in New Delhi. At that point we had internal, external, Pol-Mil [political-military], labor — four different sections. I got there toward the end of, although we did not know it at the time, the end of Mrs. Gandhi’s period in office. When she had first become Prime Minister , her relationship with the then President of the United States [Richard Nixon] was not very good at all. By 1983 things were slightly better but only slightly, and we were always seen in India as being pro-Pakistani. It has been a sort of roller coaster thing, American-Indian relationships, and it had been a no-win sort of situation, a zero-sum game because of what we did with Pakistan. In the spring of ’83 things were pretty good. She had been to the United States, and she had had a relatively good experience. Of course, President Reagan could charm the birds out of the trees if he so wished…. From my perspective the thing that mattered most was the Indo-Pak relationship, what India might or might not do in terms of nuclear proliferation, what it might do in terms of fighting with Pakistan over Kashmir, most definitely what it was doing in the state of Punjab to diffuse the situation in Punjab. There was a great deal of belief in the country at the time that Pakistan was arming and aiding the Sikh insurgency movement, and in fact there is truth to that just as India aids and abets various things that go on in Pakistan. There is a great deal of clandestine work back and forth across the border, I think. Certainly it always reminded me of that cartoon strip that used to run many years ago and maybe still does in Mad Magazine with the spy versus spy. There was a good deal of that back and forth. We were always seen, the United States was always seen, as trying to somehow get our own spies in the Indian hierarchy, particularly in the military and in the nuclear establishment and so on. But we were viewed with suspicion…. As [Indira Gandhi] moved into power after Lal Bahadur Shastri died in 1966, January of ’66, she was placed in power by the kingmakers of the party because they wanted somebody pliant. They learned to their horror shortly thereafter that Mrs. Gandhi may have been the housekeeper and chatelaine for her father but she was not pliant. By the time I got there in 1983, she was very, very much in charge of the country. They all kowtowed to her tremendously in her party. She, on the other hand, was distrustful of people. She was certainly distrustful of Americans and the United States. She ran a very closely held government. She made the decisions, and often they were made on very personal reasons. I could always see in her where so many men get their opinions about women in politics or women in any sort of official position or women in a professional position. She reacted to things on a very visceral level, and personal opinions of another person’s worth or non-worth got in the way sometimes of logical thought. She was something to me of a caricature of what a woman is seen as by a lot of men…. She had caused a terrible massacre in Amritsar, which is the holy city of the Sikhs, at the Golden Temple, which is the holiest of holies. It’s like having a shoot-out at St. Peter’s or at the Kaaba [in Mecca]. It is not the sort of place where one would want to have soldiers, and the Indian army was directed and did mount an attack there against Jarnail Bhindranwale, who was this sort of charismatic, almost Rasputin figure who was the political and religious leader of a lot of Sikhs, not of the rational, middle-ground, middle-class Sikhs, but of the people who were his followers. The problem in Punjab had been one of economy as much as anything else, and I suppose that’s true of many revolutions, is it not, or insurgencies rather. But Punjab is and was a very rich farming state with a finite amount of land, and the men who were the farmers or that had some farming families were able to send their young, particularly their young men, to local colleges giving them an education. When they got out of college, there were no particular jobs for them nor was there land anymore to divide, because the land had already been divided to a fare-thee-well. So here you have a pretty well-educated — this is not Princeton, but I mean educated — class and no place to go, and that’s where the trouble started as much as anything. 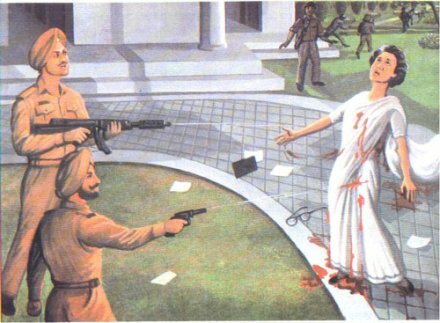 But in any case, when she ordered her troops into the Golden Temple and they got Bhindranwale, killed Bhindranwale, and a number of other followers, the die was cast and it was only a matter of time before the Sikhs got to her. They did so the following October when she was assassinated as she crossed from her private house into her office area. She was assassinated by one of her own guards, who was a Sikh. [Indira’s son] Rajiv Gandhi … was flown home immediately and was administered the oath of office by the President, who was a Sikh, Giana Zail Singh, but the trouble had already started. 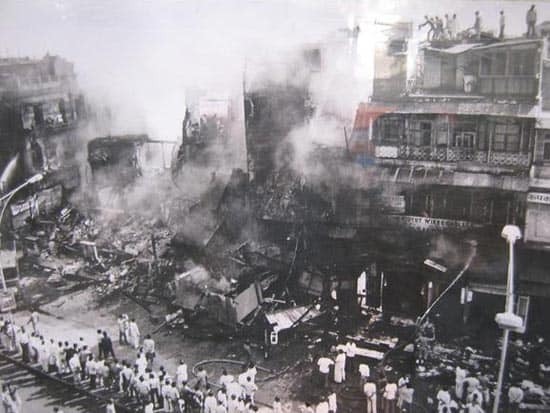 The fires were already seen around town, and several thousand Sikhs lost their lives in the following days in New Delhi as well as all over the country in various places. So once again there were lots of Sikh refugees in New Delhi living in the gurdwaras, the Sikh temples, and being cared for basically by the Sikh community, although there were other organizations helping them. The difference this time — this is, I suppose, indicative of what was happening — in the past when there had been killings of Sikhs — and this had been going on for years — those who were killed or affected tended to be the poor. This time, as a very wealthy industrialist said to me, this time we were all targets. On the Ring Road, which is the peripheral road around New Delhi, cars were being stopped and Sikhs were just being pulled out and killed on the spot. This very important and wealthy Sikh businessman recounted stories of them trying to come over his wall…. They were being targeted by the Communist Party, it is believed by many. A certain number of members of Parliament were accused, and I think rightly so, of actually leading bands to do this sort of nefarious thing. GOLDBERG: The outrage in New Delhi in particular was considerable. In fact, there were blockades on some of the roads we used to travel to get back to our home – the specific purpose was to yank Sikhs out of their cars and beat them up. The AID [U.S. Agency for International Development] Deputy Director at the time Mrs. Gandhi was assassinated was on his way back from a visit somewhere in Uttar Pradesh and along the way he had seen some Sikhs being very violently assaulted and beaten to death…. We had a lot of Sikhs coming into the mission asking for visas because they feared they would be killed if they remained in the city. The Political section officers would come down to the Consular section to talk to them about conditions in the Punjab. HECK: The remains of what happened after the death of Mrs. Gandhi have been with the country for many, many years, and it’s only recently, I would say, that the wounds have been somewhat healed. The distrust is always there at some level or another because of the same sorts of things that drive ethnic and religious violence in other parts of the country, as memories are long. But certainly today the situation has calmed down greatly. The Akali Dal [a Sikhism-centric political party ] is part of Parliament. The state is rich, Punjab is rich, the Sikhs are doing well. If there were members of [Indira Gandhi’s] Congress Party leading demonstrations and leading mobs, it certainly wasn’t the official policy of the government of the country nor of the Congress Party. So, unlike some other places I have served in, one could never say that the ruling party was part of this problem; it was not.